RANTWICK - Commuter Cycling in London Ontario | A Bike Blog: Rantwick Down! As one might expect, the cam doesn't show much of what happened. I don't know where my mind was, but it wasn't on riding my bike or the big patch of ice I rode on to just as I was turning. I mean, it looks like I was aiming for it, but honestly my mind was just elsewhere, I guess. It hurt, but my helmet prevented any real brain damage. It hurt, but my helmet prevented any real brain damage. It hurt, but my helmet prevented any real brain damage. I was kind of wanting a new helmet anyway. I hit one of my elbows super hard, but no bone damage. Did you know that the loose skin part of your elbow is called the "wenis" by some people? After I heard somebody call it that I had to look it up. Turns out it is popular slang, but not a "real" word as of yet. I had a badly bruised and and sensitive wenis. My neck was very sore and the next morning I hurt pretty much everywhere. It took three or four days for most of that to go away, but I'm right as rain again now. Except for the wenis. Still bruised and sensitive. In any case, it would seem that my preference for crashing at very low speeds is good for my health. 4.Act unhurt until out of sight. Oh Mr. Ranwick. Ouch. Thank goodness you were wearing a helmet. I wear a hemet because I occasionally take a digger. The last one was in India in the middle of nowhere. Had a headache, but came out unscathed. I'm glad you are okay...elbow may take time to heal. My husband's handlebars got caught on a vine and he fell into the road and beat up his elbow a bit. Cafiend - Who do you think you're talking to? I know those protocols like I know the sky from a prone position. Annie - I wish I was falling in remotest India... it would feel much more exotic. Elbow she be slow, alright. 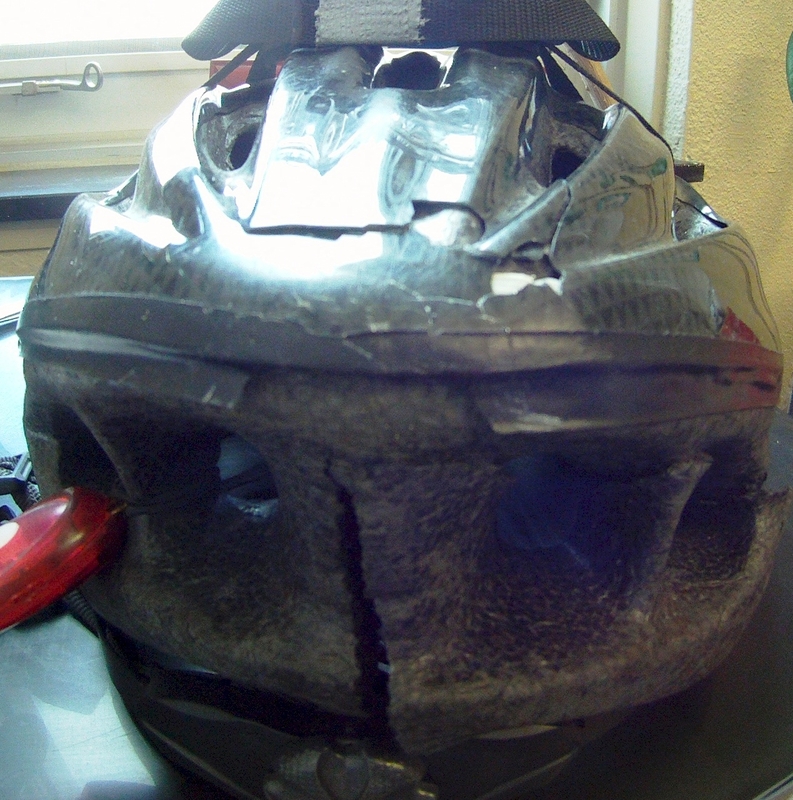 I wish you a speedy recovery and successful helmet search. 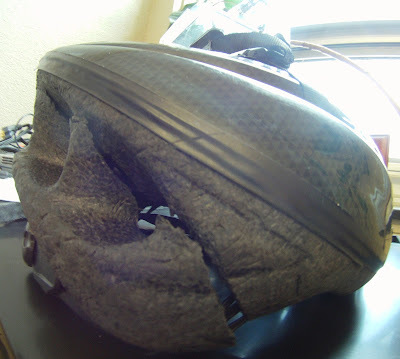 Of course I envy those whose cycling habits are so perfected that sudden arrival of head on pavement could never possibly occur, but for the rest of us, isn't there something (sore wenis aside)satisfying about picking yourself up and looking at the shattered helmet and thinking coulda been my head...? Golly, nothing at all like this has happened to me since - February 14. I'm sure it was entirely coincidental that it happened during the 25 feet of bike path out of my eight mile ride home. Luckily, the flowers did not suffer much. I'm going to be talking about my wenis all day now. Your glitching as my son the gamer would say. Hope your wenis gets feeling better soon. I'm pleased that others are into low-brow Wenis humourous. What the what?? Nice helment demolition. Glad you're ok! Ouch, dude. That's why I'm a fair weather cyclist!